That sets her apart from all the others. Every time she looks into her children’s eyes. Eden was such a paradise. Serenade the world with music in the air. To create May’s flowers from April’s rain showers. The angels in heaven applaud and rejoice. And the same love that made Jesus give His life. And you have been the greatest mother to me. His strength, His glory and His majesty. Your encouragement helps me to give a little bit more. You are such a wonderful and caring mother. That sets you apart from all the others. Need A Custom Written Mother's Day Poem? 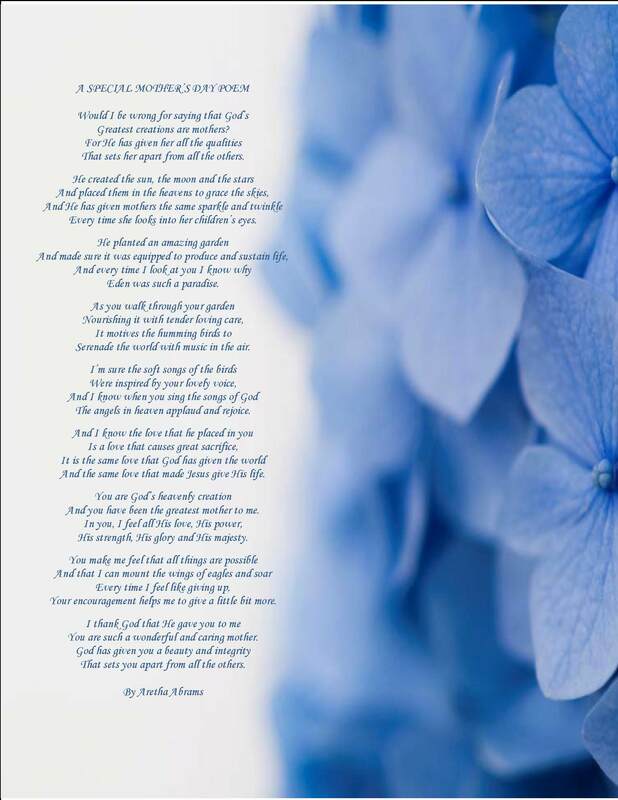 If you need a custom written poem for Mother's Day, please email arethaabrams2000@yahoo.com.